The ring tone of an eighties song blares in my kitchen. I wait for my maid to take her call. Oblivious of the screechy song she continues to bang vessels. When I hand over the phone, she looks at the screen and smiles coyly. The screen says, ‘Janu Calling’. How women address their partners in private or public is an interesting way of gauging our social climate. We have come a long way from ‘Pinky ke papa’ to ‘Pumpkin’, from ‘Husband’ to ‘Honey Buns’, and from ‘Suniye ’ to ‘Snuggle Bunny’. When it comes to naming the grandson, grandpa’s writ still rules in most households, but nick naming your husband is entirely ‘Your choice’. Call him Baby or Baba, Chotu or Motu, as long as the connotations are positive, it is more about affection than gender dynamics. Amusing how terms of endearment range from bakery items (pie, cookie, muffin) to stuffed toys (teddy, bunny, doll). And an argument at home is guaranteed if an embarrassing nick name is divulged in a formal setting. But the best part is that the argument gets downgraded to banter if Baby and Baba are thrown in for good measure. When it comes to public communication, most urban women are either on a first name basis or something generic on the lines of Sweety or Honey. But when the moniker for your husband is something like ‘Darling’ with the D pronounced as duh, you could be accused of faking it. Or drinking too much. This reminds me of a college friend who used to call her fiance My Man, and what followed was a slew of jokes about Her Man. Which sounds irrelevant today considering Twinkle Khanna, the columnist, addresses her husband as ‘The Man of the House’ in her columns. Well, it’s personal and all about her choice. On a personal note, I’m not sure if it was a ‘government servant’ protocol or a norm, but back in the eighties, my mother used to refer to her friends as Mrs. X or Mrs. Y. So today when she calls her friends by their first name, it sounds a bit odd to the ear, but pleasant to the mind. Also, I don’t remember my mother taking dad’s first name. Their communication was bereft of honey bunny stuff. Thank Lord for that because as a kid I would die of embarrassment had she suffixed ‘doo-buns-pie’ in public. One reason behind the present informality could be the lessening age gap between couples. Moreover, informal terms of affection signify a healthy relationship. Beyond all this, there is a desire to be a part of everything that is contemporary. Equally interesting is how women save the number of their spouse on their mobile. A random survey revealed that my friends store the first name, ‘hubby’ or ‘husband’. I make it a point to suffix ‘husband’ after the first name, purely as a safety measure. In case of an unlikely abduction, the abductors should know whom to call for ransom. Point to be noted: The name stored against my number in my husband's phone is The Boss, which is annoying because the way my son and husband address me makes me feel like a merciless Don. Overall, this idiosyncratic communication using nicknames or first names signifies a healthy shift in a patriarchal setup. The fact that a name plate once displayed the name of the male member, now displays the first names of the residing couple is also a small but significant step. So I ask my house help how she addresses her husband at home. I can’t take his name, my mother-in-law disapproves, she says. You've really figured the nick-name phenomenon out. Healthy relationship, contemporary, sweet-sounding, etc. So good to see you here. Sweetheart is sweet indeed. Thank you for stopping by Sakshi. 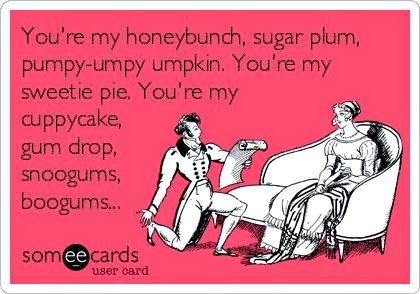 Oh yes, we all have our terms of endearments for each other. But, luckily we spare the kids or outsiders. :) I kind of like it, having our own names for each other. One funny thing is that neither G nor I call each other with the pet names that our families have given. I wonder why. Enjoyed this lighthearted post a lot! Your thoughts are almost always mine. Our wavelengths match perhaps owing to similar family backgrounds. Same here. Glad you enjoyed reading it Rachna. If life is a journey from aah men to haha men, marriage is a journey that starts with My Janu,Sonu, Monu and peters down to Abbey, Oye, Jani Dushman. It was such a joy reading this piece. Wonderful way to start the morning. Ha ha, I am beyond Janu but yet to come to the Jaani Dushman stage. Sunti Ho is very rare these days. For most women, their husband is either daddy or papa. My dad was five years elder to my mom, so I think the age factor played a role. Plus the times. What's in a name...some say. Well, everything, as some others may say. I personally am not the honey-bunny-sweetie-janu types...these terms are well, too much TV like, too unreal for my taste :) I prefer my own creative endearments, or best is first name, simple and direct! Simple and direct rules as long as it's short and easy to pronounce. Such a charming post! By the way, one of our blogger-writer friends we all know and love, stores her husband's number on her mobile as 'Delhi wala husband'. It's quite funny. But of course I shall take no names! Seriously? I don't know who she is but it will work in case of an emergency. Ek husband to ayega. This is the comment of the day! LOL. Love Rex. It's so cute. And Bhai Saab? But it doesn't matter, what matters is mutual understanding and love. Hello works for me too. I remember my mom used to address as Mrs. X and Bhai Saheb's to all their husbands. While never heard her take my dad's name. It used to be Mr. X or Sunte ho types. With regards to mine...I prefer nicknames and usually say the name when angry! :) Good to see you here Ruchira. Not taking the name was also due to the wide age gap between couples. Plus we all change with time. It is so so good to see you here. So I missed the tenor part....the weight of authority behind Suno. Ha ha. It's a personal thing and between couples. I know of someone who deliberately takes the name of her husband merely to irk the elders. So we have all kinds depending on the age, class, culture, city and region. I like Memsaheb too. Its endearing. Also, when husbands refer to wives as "usko / usne" and women say "unhone"... pfffttt, not good. With kids it's Tumahre Papa and with friends it's Ye or Vo. A lot depends on the environment we live in. I remember Ashima that our guests in the eighties were Sharma's, Mehtas or Guptas but today we take first names. Generational change. True! These name calling is changing for the better and there is nothing to be ashamed of it! Romance is getting out of the closed doors and I feel it's for the best! Thanks for stopping by Rupasi. I don't think I've ever heard my parents address each other by anything else other than their first names. And I guess it is the same with Janaki and me ; of course, there are the 'moments' where 'romantic sort of names' appear, but yes, she is perhaps the only one who actually calls me 'Sidharth'. For the rest of the world, it's always been Sid. Except on official documents, that is. Most couples today prefer first names unless there is a technical glitch. Like Prashant's ( my husband) sister is also Alka. So I had to be renamed. Ha ha...hope you had a good trek. Good to see you here Vishal. Loved reading your post..Well my parents never called out each other by their first names. When we were around - if my dad was calling me for tea or a phone call that meant - Mummy is being called upon..I think now he says "Sunti hoo"
And Mum used to say "Sun rahe hain"..
For VT and me, we go by first names..we do have private moments of lovely dovey names, but on phone and every where we go by first names! Glad you liked it Parul. And thank you for a little peek in your personal life. Thanks Asha. How couples address each other is personal but the Janu Calling incident made me pen this post. hmmm now that i think back I never heard my mom take my dad's name .. the original OH JI, YEH JI, Inhen, :) I grew up with that , thankfully the Mobile phone stuff was not invented then so I have no idea what mom or dad would have saved each other's number with.. Neither did my mom. 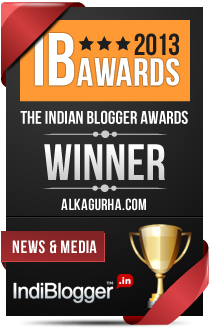 Always good to see you on my blog Bikram.